Paprika is a spice made from the grinding of dried fruits of Capsicum annuum (e.g., bell peppers or chili peppers). 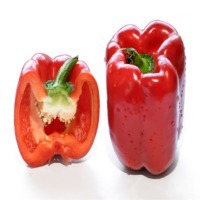 In many European languages, the word paprika refers to bell peppers themselves. The seasoning is used in many cuisines to add color and flavor to dishes. Paprika can range from sweet (mild, not hot) to spicy (hot). Flavors also vary from country to country. Usage Paprika is used as an ingredient in a broad variety of dishes throughout the world. Paprika is principally used to season and color rices, stews, and soups, such as goulash, and in the preparation of sausages as an ingredient that is mixed with meats and other spices. Paprika can also be used with henna to bring a reddish tint to hair when coloring it. Paprika powder can be added to henna powder when prepared at home. Paprika is also high in other antioxidants, containing about 10% of the level found in berries. Prevalence of nutrients, however, must be balanced against quantities ingested, which are generally negligible for spices. 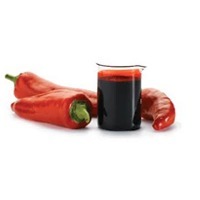 Paprika oleoresin (also known as paprika extract) is an oil soluble extract from the fruits of Capsicum Annum Linn or Capsicum Frutescens(Indian red chillies), and is primarily used as a colouring and/or flavouring in food products. 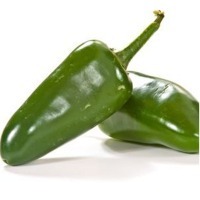 ... Oleoresin Paprika is produced by the extraction of lipids and pigments from the pods of sweet red pepper, Capsicum Annuum L. Grown in temperate climates. An oil soluble extract with it is widely used in processed foods such as sausage, dressings, dry soluble seasonings, food coatings, and snack food seasonings. Paprika Oleoresin, obtained from Capsicum, is a natural dye used as a colorant and a flavor enhancer in foods, meats and pharmaceuticals. It is obtained by percolation with a volatile solvent which should be removed subsequently, such as acetone, trichloroethylene, 2-propanol, methanol, ethanol and hexane. 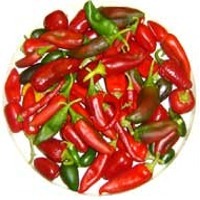 Capsaicin is the major flavouring compound, whereas capsanthin and capsorubin are major colouring compounds among variety of coloured compounds present in Paprika Oleoresin. Uses Foods coloured with paprika oleoresin include cheese, orange juice, spice mixtures, sauces, sweets and emulsified processed meats. In poultry feed it is used to deepen the colour of egg yolks. Henan Sunlight High-Tech Agri. Co., Ltd.
Water-solube:6600~59400cu Oil-solube:33000~165000cu . 4 drum/box, 5 kg/drum. Short on time? Let paprika-oleoresins sellers contact you. Shijiazhuang City Lvchuan Bio Technology., Ltd. Product name:lcss-red Description: The lcss-red is a kind capsicum extract which is used in enhancing the color of poultry and egg yolk. Uses: The product is a very adequate for pigmentation of egg yolk in combination with another source of yellow carotenoids like lcss- yellow powder or liquid solvent. Characteristic: Total xanthophyll:5g/kg minimum Moisture content:12% maximum Particle size:a minimum of 80% pass 80 mesh Package: Packed in 5kg pe with aluminum film bag or 25 kg drum. Store: ¡¡¡¡1.Store in cool and dry place. ¡¡¡¡2.Protect from light, heat, oxygen 3.The product prefer store temperature in below 30 ¡æ Packed in 5kg pe with aluminum film bag or 25 kg drum. Henan Zhongda Hengyuan Biotechnology Stock Co., Ltd.
Hebei Shun Wei Biological Technology Co., Ltd.
Sweet marjoram: Origanum (O) hortensis (orMajoranahortensis). Potmarjoram: O.onites Wildmajoram: O.vulgare. Syrian majoram is called zatar Family: Labiatae or Lamiaceae (mint family). In Europe, marjoram was a traditional symbol of youth and romantic love. Used by Romans as an aphrodisiac, it was used to cast love spells and was worn at weddings as a sign of happiness during the middle Ages. Greeks who wore marjoram wreaths at weddings called it “joy of the mountains.” It was used to brew beer before hops was discovered, and flavored a wine called hippocras. A cousin of the oregano family, marjoram originated in Mediterranean regions and is now a commonly used spice in many parts of Europe. Called zatar in the Middle east and often mistaken for oregano, it is also a popular spicing in Eastern Europe. 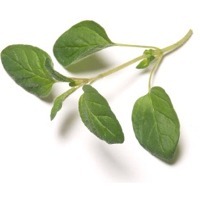 Origin and Varieties Marjoram is indigenous to northern Africa and southwest Asia. It is cultivated around the Mediterranean, in England, Central and Eastern Europe, South America, the United States, and India. Description Marjoram leaf is used fresh, as whole or chopped, and dried whole or broken, and ground. The flowering tops and seeds, which are not as strong as the leaves, are also used as flavorings. Sweet marjoram is a small and oval-shaped leaf. It is light green with a greyish tint. Marjoram is fresh, spicy, bitter, and slightly pungent with camphor like notes. 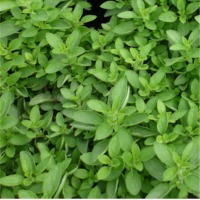 It has the fragrant herbaceous and delicate, sweet aroma of thyme and sweet basil. Pot marjoram is bitter and less sweet. Chemical Components Sweet marjoram has 0.3% to 1% essential oil, mostly monoterpenes. It is yellowish to dark greenish brown in color. It mainly consists of cis-sabinene hydrate (8% to 40%), -terpinene (10%), a-terpinene (7.6%), linalyl acetate (2.2%), terpinen 4-ol (18% to 48%), myrcene (1.0%), linalool (9% to 39%), -cymene (3.2%), caryophyllene (2.6%), and a-terpineol (7.6%). Its flavor varies widely depending on its origins. The Indian and Turkish sweet marjorams have more d-linalool, caryophyllene, carvacrol, and eugenol. Its oleoresin is dark green, and 2.5 lb. are equivalent to 100 lb. of freshly ground marjoram. Marjoram contains calcium, iron, magnesium, phosphorus, potassium, sodium, vitamin A, vitamin C, and niacin. Culinary uses of Marjoram Marjoram is typically used in European cooking and is added to fish sauces, clam chowder, butter-based sauces, salads, tomato-based sauces, vinegar, mushroom sauces, and eggplant. In Germany, marjoram is called the “sausage herb” and is used with thyme and other spices in different types of sausages. It is usually added at the end of cooking to retain its delicate flavor or as a garnish. It goes well with vegetables including cabbages, potatoes, and beans. 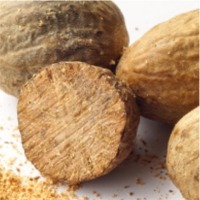 The seeds are used to flavor confectionary and meat products. PARSLEY (Petroselinum sativum/crispum - Umbelliferae) Parsley is a hardy biennial herb which is native to the eastern Mediterranean. It is thought to have originated in Sardinia, but records show that seeds were imported to Britain from Sardinia in 1548; the plant had already been introduced to northern Europe by the Romans. There are several varieties of the herb. The curly leaved or moss-curled is the one most familiar in Britain as a garnish. The plain- or flat-leaved, continental parsley has heavily divided leaves, but they are not so curly; this is the plant which can be confused with another, Aethusa cynapium or fool's parsley, which is poisonous. Less familiar is the Neapolitan parsley from southern Italy which has thick stalks, eaten in Italy like celery (and, in fact, its French name is 'persil aux jeuilles de cileri'). All parsleys have carrot-shaped roots which can be eaten, but the Hamburg parsley (P. fusiformis) has been developed for its roots rather than its leaves. The common parsleys have dark green leaves, pale yellow-green flowers in umbels, followed by fruit seeds. The name petroselinum comes from the Greek for rock celery, referring to the natural habitat of the plant. Interestingly, selinum is thought to be the same as selinon, the Greek name for celery; the Romans called parsley 'apium', also the botanical name for celery; and French fool's parsley is called ache des chiens, ache also once a name for wild celery. Celery also belongs to the Umbelliferae family, and possibly there have been confusions over the years. 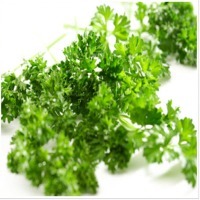 The Ancient Egyptians used parsley, as did the Greeks, who crowned victorious soldiers with wreaths of it. Hercules did this after killing the Nemean lion, and thereafter victors in the Nemean and Isthmian games would do the same. They believed that parsley had grown from the blood of a hero, Archemorus, and Homer tells of a victory won by charioteers whose horses had renewed vigour after eating parsley. Parsley grew on Circe's lawn in the Odyssey. Pliny said that no sauce or salad should be without parsley, as did Galen, and both Pliny and Dioscorides thought of it as a diuretic and emmenagogue. Apicius sang its praises too. The Byzantines used it as a diuretic and made a strong infusion to help kidney stones. Charlemagne ordered that it be cultivated in the imperial gardens as a vegetable, and it was eaten at every meal. It also found a place in monastic gardens at this time. More recently, in the nineteenth century research was done on the emmenagogic properties of a constituent of the oil, apiol, by Professor Galligo, and doctors de Poggeschi and Marrotte. These were later confirmed by Dr Leclerc, proving to be truly efficaceous in treating cases of menstrual problems, particularly pain. Lovage-, Levisticum officinale, is a perennial herb that looks like parsley and is in the parsley, or Apiaceae, family, like anise, dill, caraway, cumin, and fennel. Lovage is native to mountainous areas of southern Europe and Asia Minor. It is sometimes called sea parsley. Lovage (Levisticum officinale) is a plant, the leaves and seeds or fruit of which are used to flavor food, especially in South European cuisine. It is a tall (3 to 9 ft) perennial that vaguely resembles its cousin celery in appearance and in flavor. Lovage also sometimes gets referred to as smallage, but this is more properly used for celery. Herb (Levisticum officinale) of the parsley family, native to southern Europe. 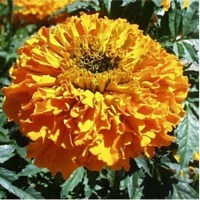 It is cultivated for its stalks and foliage, which are used for tea, as a vegetable, and to flavour foods. Its rhizomes are used as a carminative, and the seeds are used for flavouring desserts. Oil obtained from the flowers is used in perfumery. The French call lovage céleri bâtard, "false celery," because of its strong resemblance to that plant. Lovage has been used since Greek and Roman times for everything from a seasoning, to a curative for maladies ranging from indigestion to freckles, to a love potion. It grows up to 7 feet high and has large, dark green, celerylike leaves. The flavor of the pale stalks is that of very strong celery. The leaves, seeds and stalks can be used (in small amounts because of their potent flavor) in salads, stews and other dishes such as fowl and game. The stalks can be cooked as a vegetable. 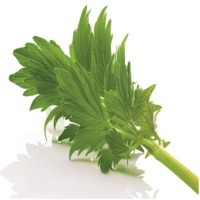 Dried lovage leaves and chopped or powdered stalks can be found in natural food stores and gourmet markets. The seeds are commonly called celery seed. Lovage is also called smallage and smellage. lovage, tall perennial herb (Levisticum officinale) of the family Umbelliferae (parsley family), native to the mountains of S Europe and cultivated elsewhere. Its aromatic fruits are used in soups and as a flavoring for confectionery and for some liqueurs. 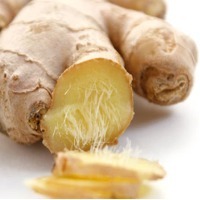 An aromatic oil extracted from the roots has been used medicinally and also for flavoring. The edible leaves are usually used like celery. Lovage is classified in the division Magnoliophyta, class Magnoliopsida, order Apiales, family Umbelliferae.